We believe that learning takes place not only in the classroom. That by digging in and working on a real project, the theories you learn in class will stick with you. We call these authentic experiences, because you’re not just running simulations in a lab, you’re working on real solutions to real problems. That’s why we created personal learning platforms. As an electrical and computer engineering major at Oregon State, you will get hands-on experiences from the very first term of your freshman year. You will continue to use your platform as you progress through the program. And because we encourage you use your creativity to try new things, you’ll end up with a platform that is uniquely yours. And there are many more opportunities for you to get other valuable hands-on experience. Read the feature stories on the right or click on the links below to learn more. 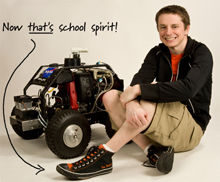 You could join the OSU Robotics Club and help build a Mars rover. Or work on the electronics or computer system of the SAE formula race car. Or join the Linux Users Group and contribute to open source projects. You’ll get to work with students from other majors, too, which is critical to your success in the real world. 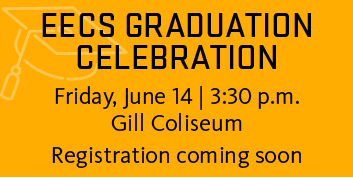 All EECS students complete a year-long senior capstone class that exposes you to the challenges of engineering design and project management by designing, building, and testing a product. You’ll have the opportunity to participate in MECOP (Multiple Engineering Cooperative Program), a premier internship program that provides students with two six-month internships during their undergraduate careers. Or you could become a teaching assistant, even as an undergraduate student. Or if you think you might want to go to graduate school, you can participate in an REU (Research Experiences for Undergraduates) program.